I would just *love* to get my hands (and my paintbrush) on this house. I found it the other day while I was searching for an example to add on to my latest Zoopla blog post on the importance of having a super-clean house, and I couldn’t resist showing it to you. I’m not showing it to laugh at or to make fun of, but just to illustrate that even top-of-the-market houses can benefit from taking on the principles of savvy selling. The living room above for example could really do with losing the red ceiling and the patterned carpet, and then the rest of the rather attention-grabbing features wouldn’t seem quite so much of a task to change. It’s a very particular style that I just don’t think will appeal to many other people, and all-in-all it’s presenting a rather large job for a buyer to take on. It’s important to remember that most buyers will expect a significant reduction in the value if feel they would be taking on a large refurbishment project. 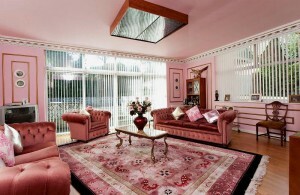 Next is a very pink living room which again requires a particular taste. Also, vertical blinds in anything other than a formal stuffy boring office are a big no as far as I’m concerned! 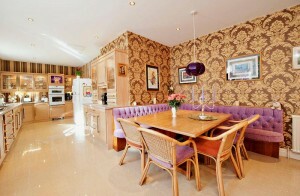 The kitchen with bench-style dining area is great, but those two warring wallpapers just fight for your attention and the poor room istelf loses out. Painting over them with plain off-white or a pale grey would put the room back in centre stage. This is the master bedroom and while it is indeed huge, my attention is drawn to the rather large pink-upholstered headboard and attached bedside tables. The blue pelmet doesn’t do the room any favours either and actually, I’d prefer the bed to be somewhere other than blocking those rather gorgeous bay windows. 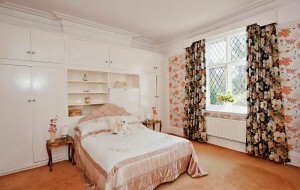 This room is more subtle than some of the others though, so that’s good! 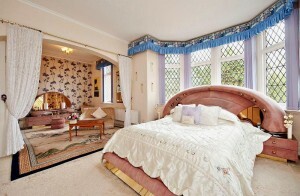 This bedroom suffers from competing patterns again, with the two different floral designs on the wallpaper and curtains. Mixing patterns can work, but it’s usually best to avoid putting them right next to each other and you’ll have more success if you choose two pattern sizes rather than using the same size as they have done here. But hey, it’s only one thing to change so it’s not so bad! 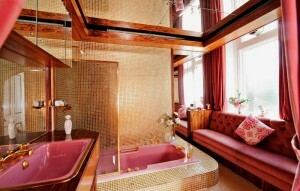 Mirrors galore and a pink suite, with a viewing bench! Finally we come to the bathrooms. I have to give the photographer so much credit for this first image – how on earth did they manage to keep themselves out of the shot?! 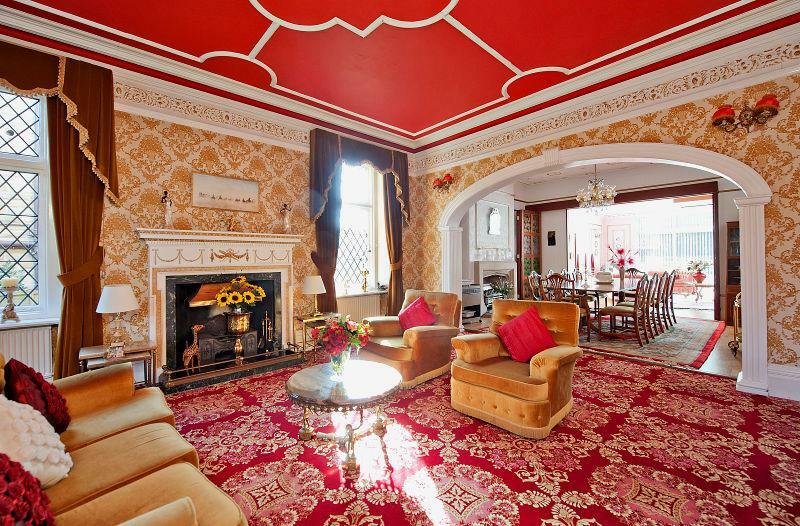 I’m certain that most of today’s buyers would consider this room to need a complete overhaul, and would probably want about £10,000 knocked off the price in return. It needn’t cost that much of course, but that’s not the point. And of course we’ve only seen 2 out of the 7 bedrooms so there could be at least 5 more rooms that generate a rather love/hate reaction. 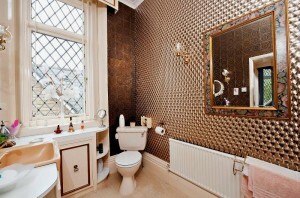 If this house struggles to sell or the only offers are well below asking price, I would recommend re-decorating to remove most of the patterned elements and I would replace that pink bathroom. The owners may well sell for a price they’re happy with and not have to change anything at all, but if that doesn’t happen it would be a good idea to reduce the level of work that buyers perceive needs doing before they can call it home. Here’s the link to the house on Zoopla – I wish the owners well with their sale but will be here to assist if things don’t work out. And if they’d like to do it themselves, here’s the link to buy my book!